Some New Year’s resolutions never make it out of the gate. It’s always going to be the year of healthy eating until the first king cake shows up at the office. But if your 2018 goals include finding a new job you’ve still got plenty of time. And while there may be a chill in the air, the job market is heating up. 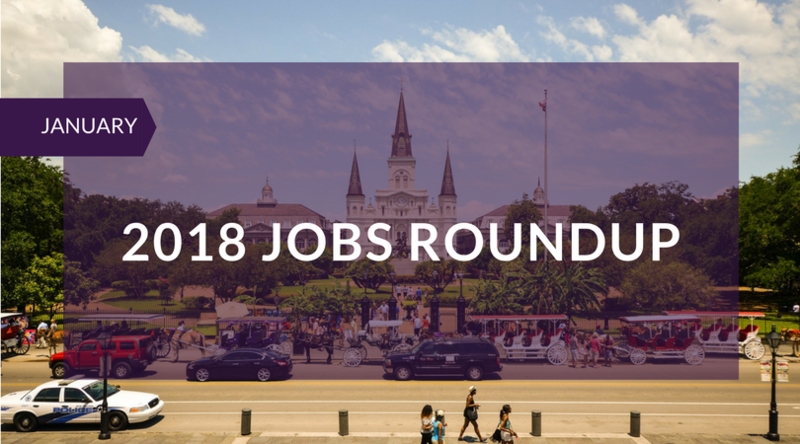 We’ve rounded up several fantastic organizations hiring in New Orleans, and we wanted to pass the word along to you. SBP, Inc. (formerly, St. Bernard Project) is an award-winning, innovative nonprofit organization that minimizes the time between a disaster and recovery response. A leader in volunteer-driven, post-disaster rebuilding; SBP educates, advocates, and improves the disaster recovery sector so that our communities can recover more rapidly and effectively. With a team of 50 staff and 180 AmeriCorps members, SBP has rebuilt more than 1,170 homes across 7 states and shared best practices with many more. The Director of Human Resources role is a unique opportunity for an individual interested in driving the development of a high-performing culture for a rapidly expanding, national nonprofit. The Director of Human Resources will ensure that SBP invests in their best assets – their people – and embraces constant improvement and innovation to recruit, onboard, train, develop, and support the team. For other roles that SBP is hiring, including a Director of Communications, click here. OnlyYOU Genetics is a pharmacogenetics company that measures and uses individual genetic profiles to help guide individuals and their healthcare professionals to utilize the right medications. The organization takes an innovative approach to personal healthcare by scanning how individuals respond to different pharmaceutical drugs and cannabinoids. OnlyYOU Genetics is looking for two sales reps to sell to Senior Management (C-Suite) at non-profit organizations, digital publishers, and other organizations involved in the medical cannabis industry around the country. With the option to work from home and be part of a small fast-growing team, this role has got entrepreneur written all over it. Sales experience required. That’s right – we’re doing some hiring of our own! Some quick background on trepwise: we are a business advisory firm located in New Orleans that works with organizations to improve Strategy, Operations, Finance, and Marketing. We work across industries and sectors, serving clients from the for-profit, non-profit, public and philanthropic sectors. Our client portfolio ranges from entrepreneurs with an idea to multi-million dollar companies with 20+ years of experience in their fields. Check out some of our past clients! We are seeking a hard-working, passionate and highly driven college junior, senior, or graduate candidate to support client-facing work as well as internal initiatives. Our intern will have the opportunity to participate in client meetings and learn firsthand from experienced trepwise advisors and associates the necessary frameworks, strategies, and tools to start, sustain, grow, and expand a profitable and/or sustainable business. This opportunity is ideal for a student interested in business, entrepreneurship and/or consulting, who can take these learnings and apply them to future endeavors. Mudbug Media, located in the Energy Centre on Poydras, provides web application development and online marketing for medical technology companies and medical practices. The company has built expertise in the medical field over the past 20 years and is looking to continue to grow. With a casual work environment and awesome professional development opportunities, Mudbug is basically a startup but with a proven business model. The marketing department at Mudbug Media has two key responsibilities: acquire new work for the company and provide marketing services for their clients. The Digital Marketing Specialist will be mainly responsible for client work, ensuring that all deliverables are up to the highest standards in demonstrating Mudbug Media’s expertise. Mudbug season won’t peak until March, but hiring for this role starts right now. You may know them from GiveNOLA Day. But the Greater New Orleans Foundation is so much more. With a mission to drive positive impact through philanthropy, leadership, and action in the Greater New Orleans region, the Foundation partners with generous people in the community to tackle major regional challenges, from urban water management to chronic unemployment. The Foundation is hiring a Workforce Navigator to assist in the start-up and implementation of its New Orleans Workforce Innovations program, based on the nationally recognized Sustainable Workforce Model (see worklabinnovations.org). The Sustainable Workforce Model minimizes work disruptions, decreases absenteeism, improves workers’ financial stability, and ultimately increases employee retention and engagement by offering personalized, immediate, one-on-one assistance when workers need it most. If you’ve got work experience in direct services (e.g. case management, career counseling, financial coaching, etc.) and in using strengths-based approaches this might be the role for you! Calling all artists who believe in the mission of “arts for all”… and like teaching children. Upturn Arts is a fun and creative arts program that teaches children in the New Orleans community to explore and build confidence in themselves as artists. What began as a small summer camp in 2010 has since evolved into a program reaching over 600 young artists through on-site programming, after-school programming, and camps. You might remember them from Propeller’s PitchNOLA competition in 2016 (Side Note: Propeller is in the process of hiring a Programs Coordinator – learn more here). Upturn Arts is hiring Music, Theatre and Yoga teachers for the spring semester to work with students ages 3-5 and 6-12. But sign up quick – the application deadline is January 12th. Namaste.